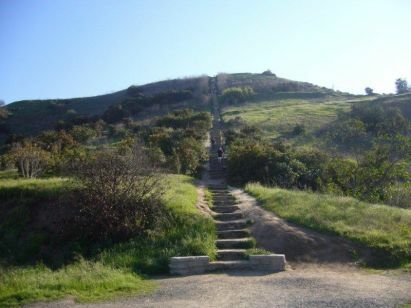 The Culver City stairs are located off of Jefferson Blvd. and are sometimes referred to as the “other stairs” on the westside. The massive stone steps follow a sharp, steep climb to the Baldwin Hills Overlook which is arguably one of the best views in all of Los Angeles. From the ocean to the Hollywood sign, you can see it all! The stairs are quite challenging and you should expect to hit about 300 of them on your way up. There are some dirt paths winding along the side of the stairs which can alleviate some of the stepping if you choose to use them. Free parking is available along Jefferson Blvd. at the base of the stairs, or you can park at the top of the Scenic Overlook for $6. The Overlook has a Visitors Center (only open on the weekends! ), clean bathrooms, and plenty of open space for a picnic. As longtime fans of the Santa Monica stairs, we decided it was time to try the not as popular but highly talked about Culver City Stairs. 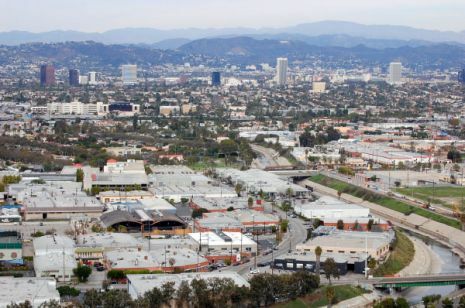 We know, right now you’re probably saying, “Are there really stairs in Culver City”? There are…and they are not for the faint of heart! The entrance to the Baldwin Hills Scenic Overlook is located just off of Jefferson Blvd. There are two parking options…you can either park on Jefferson for free or drive to the top of the overlook and pay $6. We parked at the bottom and took the trail to the start of the stairs. Standing at the bottom of the stairs is breathtaking, as they seem to go forever! These are nothing like the Santa Monica stairs. Each step is different in height and depth, which helps to tone the tush and the steep ascent will really take your breath away!! The view at the top is spectacular and it is absolutely serene and peaceful. Our only issue is getting to the bottom. We just assumed that we could walk back down the stairs, big mistake! Since the stairs have such varying heights, you really have to be careful and well, we both got pretty nauseous looking down at our feet. Although their are multiple trails, none will take you all the way to the bottom except for the paved road which is slightly out of the way. We won’t lie, it was a great workout but, we will probably stick most frequently to the Santa Monica stairs and reserve this hike for more rare occasions. It would definitely be a great way to show out-of-towners the city if they are up for a climb! The steps are REALLY tall. Great for glut strengthening. The other positive is that the trails are beautiful in the Springtime with wildflowers on either side of the steps. The one negative though is parking on the opposite side of Jefferson and having to run across the lanes of traffic. I wish they would put in a crosswalk. I give the workout 3 stars for being free, outdoors, and pretty in the Spring.